Editor: I’ve been asked for an update regarding the planned installation of Fibre Broadband to the residents in the south of the village. The following is information from the last Parish Council meeting in March (the Appendix information is important!). Councillor Park-Weir reported that BDUK (EDITOR: Broadband Delivery UK is part of the Department for Digital, Culture, Media and Sport which is “delivering superfast broadband and local full fibre networks to the nation”) has still not given formal approval for the project, although Open Reach and HCC (EDITOR: Hampshire County Council) have answered all queries as far as EBAG (EDITOR: Ellisfield Broadband Action Group) is aware. Open Reach has received a request from HCC to begin administration work but information will not be sent to contractors until money has been transferred. It now seems that work will probably not be completed until March 2020 (approx.). EDITOR: See appendix below. There was some consternation about the fact that, although EBAG asked relevant questions before signing the contract, the group was not informed that this long approval period should be expected. The result is that a large amount of money has been given to HCC, which is not being used, and the project is approximately 6 months later in starting than EBAG was led to believe. There was discussion about whether HCC should pay interest on the money that has been received from EBAG. Ranil Jayawardena MP and (EDITOR: County) Councillor Anna McNair Scott have been informed. Councillor Park-Weir agreed to ask EBAG if it would be helpful for EPC (EDITOR: Ellisfield Parish Council) or the Chairman to write a letter supporting their position. Glenn confirmed the questions (related to post codes and numbers) on the CIA have now been answered so Glenn is expecting to get the signed copy back from BDUK within the next 2 weeks. Based on this, HCC will be able to sign the contract with Open Reach subject to completion of Open Reach’s Planning stage (see below). Shaun Dale confirmed that 1st part of planning is complete (known as the Desktop Plan). The 2nd stage (field work to check what has been planned is feasible on the ground) is now in progress and will take around 5-6 weeks to complete, so by end April. Assuming we get the signed copy back from the BDUK, then HCC will be able to sign the contract between BDUK and HCC which is effectively the instruction for Open Reach to engage suppliers to implement the plan. The current timing for Go Live remains as November 2019 at present. I’ve just upgraded my broadband to take advantage of “fibre to cabinet” now installed at the BT cabinet at the junction of College Lane and Church Lane (aka “Ellisfield North”). I thought it might be useful for residents whose phone lines are from that cabinet and who have not yet upgraded to know that I’m now getting 25Mbps download speed (it was a miserable 1.85Mbps). As Pullens Cottage is probably the furthest house from the cabinet, other residents will almost certainly get a faster speed. I got the upgrade from BT for exactly the same price of £25.99 per month and that includes the landline and unlimited broadband. I also did not have to pay for the new router or pay any money upfront. NOTE: Whenever I needed a fast connection (for example, when receiving Windows 10 updates), I tethered my mobile phone to my computer. Typical minimum download speeds were 46Mbps, twice as fast as the new BT fibre to cabinet, copper to home, connection. However, for what usually I need to do, 25Mbps is perfectly acceptable. The only disadvantage is that EE’s upload speed is around 15Mbps compared to BT’s 1.25Mbps. However, if I really need to have faster speeds when I’m, for example, uploading a large website file, then I still have the option of using the tethered mobile phone. Ellisfield Broadband Action Group (EBAG) have reported that the target of £22,442 has been reached and that all the money is now in the bank. EBAG will be meeting Hampshire County Council and Openreach on Wednesday, June 6. Following the EBAG (Ellisfield Broadband Action Group) meeting on 16 May, pledges are now being collected towards the target of £22,442. So far, £14,675 has been collected. A Treasurers account has been opened for dual signatory. Monies are being collected into this account. A meeting with HCC and OpenReach has been requested to go through the details of the project and to discuss the contract with HCC. All the relevant information will be communicated before the contract is signed and before any monies leave the EBAG account. Residents whose telephone is connected to the BT Cabinet at the top of College Lane can now upgrade to “fast” broadband. The connection to the house will still be via the existing copper wires, so the further away from the cabinet you are, the slower the speed will be. For further information (including a map showing which houses can now upgrade) click HERE. 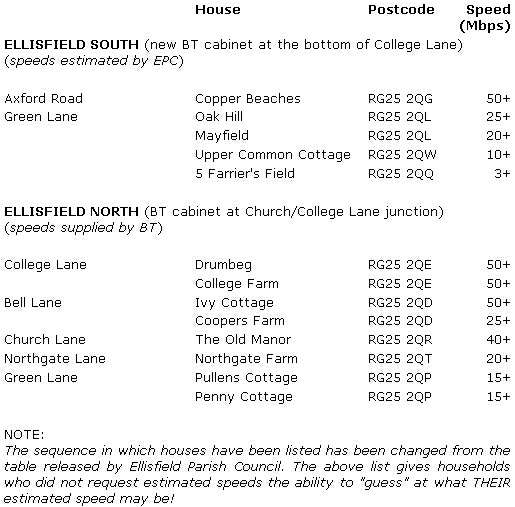 NOTE: BT Openreach / Hampshire County Council have provided a quote to provide superfast broadband to Ellisfield South. £22,500 will need to be raised to order this service. A second leaflet (click link to display PDF) was emailed out to residents today. A quote is being prepared by Hampshire County Council (HCC) for BT to install fibre to the bottom of the village. This quote (hopefully subsidised by a Government voucher scheme) will be available some time in January. At a recent meeting with HCC and BT, it was stated that the north of the village is scheduled to have fibre to the cabinet installed before the end of 2018. A leaflet (click link to display PDF) was distributed around the village over the weekend, providing information on the current options for residents living in the south of the village to obtain fast broadband (the north are scheduled to have fibre to the cabinet installed next year - still no date though …). “The roll out of publicly funded superfast broadband in Hampshire is ongoing. Currently over 92% of premises have access to superfast broadband. “Current contracts will ensure that superfast broadband services will be available to more than 97% of premises by 2019. “For premises not covered by superfast broadband, the Government will ensure universal broadband access of at least 10Mbps by 2020, so that no home or business is left behind. “We are currently considering two options for delivering this: a regulatory USO and a voluntary offer from BT and Openreach. A consultation on the design of the regulatory USO was published on 30 July and closes on 9 October. EDITOR: The first post on this page was four and a half years ago! EDITOR: Yes, nearly 14 months have passed and still nothing to report. At some time, possibly in 2017, the cabinet at the junction of Church Lane and College Lane will have a fibre connection installed. However, there is still no action promised on upgrading the lower half of the village. At Tuesday's parish council meeting, Cllr Park-Weir was asked if there was any more news about Ellisfield obtaining superfast broadband. He replied that there was not. The current situation is that properties in the north of the village (those served from the cabinet at the junction of College Lane and Church Lane) ARE scheduled to be upgraded in Hampshire County Council's "Phase 2". The currently proposed installation date (taken from HCC's website) is: Coming soon - July 2017 to June 2018. So, "soon" is at least 21 months, perhaps as much as 33 months! Properties linked to the cabinet in Herriard are too far away to make use of that cabinet's Superfast Broadband connection and they are not scheduled to be looked at until all the Phase 2 installations have been completed (currently September 2018). It should be noted that because the north of the village IS scheduled in Phase 2, a privately funded installation is now not possible. At this evening's parish council meeting, Cllr Gavin Park-Weir agreed to take over from Cllr Julian Wright (who recently retired as a parish councillor) in promoting the installation of Fast Broadband in Ellisfield. Ranil Jayawardena (see right), our Member of Parliament, met with BT director Tim O’Sullivan last Wednesday to discuss ways to improve better access to fast broadband for the almost 30,000 homes and businesses across north east Hampshire that do not have access to superfast broadband. As reported in the Basingstoke Gazette, Mr Jayawardena said: “In the 21st century, all residents should be able to access fast broadband, even in rural areas such as Mattingley, Stratfield Turgis and Ellisfield." EDITOR: It's good to hear that our MP is aware that Ellisfield needs superfast broadband. Those residents who have signed up for email updates from Hampshire County Council in regards to the roll-out of superfast fibre broadband will have received THIS email today. "The Government has set out plans to offer improved services to all of those currently experiencing under 2 Mbps of broadband. BT is working on this solution at the moment and we will be able to offer this by the end of 2015." EDITOR: It has just been noticed that the following was posted on the Parish Council website last week! Please see the "Note" at the bottom of the table of estimated speeds. EDITOR: In his posting above, Cllr Wright mentioned that "BT have at last now supplied indicative speeds for most of the selected Ellisfield North properties". Ellisfield Parish Council was asked which households in the Ellisfield North area were calculated by Cllr Wright, not by BT. "Understandably the email regarding Broadband needed forwarding for advice and/or any specialist comments which, if forthcoming, will be relayed to you, and/or published, as appropriate." Cllr Wright stated that BT have put in a reduced quote for installing fibre broadband into the village (he did not provide the new figures), that estimated speeds would be announced soon to those residents who had requested this information (EDITOR: Over four months ago!) and that investigations were proceeding regarding the possibility of setting up a "vehicle" whereby residents' contributions could be made tax efficient. At least 20 residents attended specifically to understand the current situation with the village’s Broadband project. In terms of the county programme, the contract had now been let for wave 2 of the HCC/BT Openreach Superfast Broadband programme. Cllr Wright explained that the HCC programme is due to deliver Superfast broadband to Ellisfield North in December 2018. Other parts of Ellisfield would be eligible for future waves. The alternative private project was significantly short of its fundraising target. External funding is being sought from various sources. In the absence of additional funding then residents would need to roughly double their pledges. Residents expressed the view that they would like to see a higher participation rate than the current 40% before considering increasing their pledges. Residents’ seemed irritated that despite many requests, BT had not provided estimated speeds likely under the proposed BT Infinity service. An important factor here is line quality which can significantly degrade the speed attained but individual residents need to report line faults/issues to their service provider. Cllr Wright undertook to follow up again with BT on predicted speeds. Cllr Wright confirmed minimum guaranteed Broadband speed was >2 Mb from late 2015/early 2016. It is uncertain what form this programme would take and whether the funds could be redeployed elsewhere such as a subsidy to the village’s private project. In addition HCC are considering offering to part-fund private projects in general. Cllr Park-Weir stated that there were potential tax and VAT reliefs possibly reducing Ellisfield total contributions. A resident suggested this was specialised accounting but had contacts useful to advise EPC. Alternatively SEEDA enterprise funding might be feasible but needed investigation. Cllr Park-Weir was keen to contact new ‘accounting’ contacts in case. Cllr Wright also asked residents to consider differing scenarios across Ellisfield i.e. the ‘top of village’ might have earlier installation because technology and distances there were simpler than for ‘lower village.’ Residents apparently strongly resisted this option wanting all households treated equally, in similar timeframes, so as not to divide Ellisfield. EPC committed to continue with a single village-wide project if this was financially viable. As no decisions could be made yet, Cllr Wright undertook to continue investigating. All residents were assured that all Ellisfield households would be surveyed for final funding decisions when further information became available. "Hampshire County Council (HCC) have now signed a contract with BT Openreach for the second stage of their Superfast Broadband programme and issued a press release explaining that Superfast coverage will extend to 95% of the county, completing by mid 2019. "HCC have given Ellisfield Parish Council (EPC) an early view of the scope of the second contract, prior to the details being published on the HCC website by the end of January. We understand that the Ellisfield North (Herriard 2) cabinet is included in the later stages of the programme but the Ellisfield South, Berrydown Lane and Grammarsham Lane properties are not covered. "By way of reminder the Ellisfield North (Herriard 2) cabinet is the existing BT cabinet at the junction between College Lane and Church Lane. This cabinet is connected to 50 houses plus the solar farm and anaerobic digester sites (Bell Lane, Green Lane from Meadow View, College Lane from College Farm, Church Lane, Northgate Lane and Bushywarren Lane). "Given the rural demographics we are pleased to see that there is at least some HCC investment proposed for Ellisfield. The EPC Broadband Team will continue to work on options to provide Superfast broadband to the whole village, through public or private funding or a combination of the two. "We still have not received the estimated fast broadband speeds achievable for the various houses for which it was requested and will continue to press for this BT promised information. "In addition we are still investigating whether any of the businesses on Bushywarren Lane would benefit from a quicker roll out of fast broadband and so would contribute to this or would be willing to make a community support donation to help the disadvantaged residents in Ellisfield South. "We will be providing a full update on the broadband project at the next EPC meeting on Monday 26th January (the meeting will commence at 7:30pm in the Memorial Hall)." EDITOR: It'll be good to find out the timescale for the installation of fibre to the top of the village and to hear what the parish council proposes for the rest of Ellisfield. It is now exactly two months since the Parish Council emailed residents regarding the "pledges" made (and required) to raise the money for fibre cable to be installed in Ellisfield. In the Q&A PDF document attached to that email it was stated that BT had been asked to provide estimated speeds to the 12 households that had requested this information. "The total pledges made to-date amount to £34,136, a big thank you from the broadband team for a tremendous achievement in such a short space of time. "We have recently taken soundings from two completed private projects. The biggest lesson to be drawn is the need for a village to be united, all pulling in the same direction. The Rotherwick project attracted pledges from 71% of the village and the Preston (Herts) project an amazing 92%. Ellisfield today stands at 38% reflecting a large number of undecided residents. We are keen that you make your decision in a fully informed manner and to that end have produced the attached FAQ document (to navigate click on desired question in the contents and then “Home” key to return). Please note that BT are in the process of modelling a number of on premise broadband speeds and that the document will be reissued when we receive the information. "In parallel with completing the village fundraising, we are now looking at potential commercial sponsors and will be engaging in initial discussions with Hampshire County Council." EDITOR: Interestingly, there is a statement in the Q&A document that says that an "unused underground cable ducting" running between Herriard and College Lane has "been discovered". However, I believe (and I'm happy to be proved wrong) that this ducting actually carries BT's 100 core copper cable which connects all the houses in the south of Ellisfield to the Herriard exchange. If that's true, why were BT surprised to find it? See the October 25 News Item below for a few other questions not addressed in the Q&A PDF document. The Ellisfield Broadband Fundraising team (the names of the residents on this "Team" are unknown) are meeting this weekend. An email went out from the Parish Clerk saying that "if you haven’t yet but would like to make a pledge, perhaps I could ask you to reply to this email by Saturday evening". EDITOR: If you have "pledged" money (or plan to or are thinking about it) without knowing what speed you're likely to attain when fibre is installed, then it's strongly advised that you email your phone number to Ellisfield Parish Council as requested (see October 13 News Item below). Installation of fibre to the cabinet in Herriard (the one beside the Fur and Feathers pub) is still scheduled for next month and Herriard residents who are reasonably close to that cabinet should then be able to order "Fast Broadband" before Christmas. It will then be very interesting to find out what their real speeds are! Cllr Julian Wright is adamant that if fibre is installed in Ellisfield cabinets then all of us with our current ADSL broadband connection contracts will NOT see any increase in speed! If that's so, residents must factor in the cost of upgrading their service to (say) BT Infinity2 (also known as "superfast fibre") which has speeds of up to 78Mbps and is £26 a month (ie, £312 per annum). There are (apocryphal?) stories flying around about communities who could not raise the money for a "community funded" installation of fibre but who had it installed anyway. Does BT Openreach Field Engineers' online (intranet) documentation show that Ellisfield is already scheduled for an upgrade to fibre in the first half of next year? The government has promised that all communities will have "at least 2Mbps in the lifetime of this Parliament" (ie, by May 2015). How can this be accomplished in Ellisfield? The email sent out today by Ellisfield Parish Council explaining BT's quotation for installing fibre to the existing College/Church Lane cabinet and for installing fibre to a new cabinet at the bottom of College Lane has been converted to a PDF document (click on link to display). This PDF also contains, on the last page, the map showing distances from each cabinet to Ellisfield properties (display the PDF in Full Page mode to view the map's details). Estimated speeds following installation of fibre to cabinet range from 80Mbps (for properties close to a cabinet) down to little more than 10Mbps. EDITOR: It is therefore important that residents who are interested in what speed they may attain email their phone number to Ellisfield Parish Council as requested. The village was well represented by many Ellisfield residents eager to hear more about BT's quotation of £66,329 (excluding VAT) for providing "Fibre to Cabinet" broadband to the whole of Ellisfield (excluding 4 houses on the extreme outskirts of the parish). Currently, there are two BT cabinets in Ellisfield, one at the junction of College Lane and Church Lane (serving the top of the village) and one at The Fox (serving the rest of the village). BT's quotation outlines two separate costs. The first is for installing fibre to a replacement College/Church Lane cabinet. The second is to provide fibre to a brand new cabinet at the bottom of College Lane. After the BT presentation, the Parish Council confirmed that it would communicate with all residents (and local businesses) in regards to obtaining pledges sufficient for placing a "Community Funded Contract" with BT. If an order can then be placed with BT by the end of this month, BT have committed to having everything installed by next August. EDITOR: I have highlighted in bold the items of most interest. Also, please note that the purpose of the working party proposed by the Parish Council is purely to "assist with fund raising for the recommended village-wide solution, specifically BT Infinity 2". It is NOT about sharing knowledge or discussing alternatives. Cllr Wright informs me that "we all need to act in a selfless manner in the best interests of the village and that’s a pre-requisite for anyone engaging in the working party". Want to see the value of your home increased ! "IT COULD BE ACHIEVED IN SHORT ORDER IF BT BRING “fibre to the cabinet” to the cabinet at the College Lane/Church Lane junction and put a new cabinet at the Axford Road end of College Lane. This would enable “superfast broadband” to be delivered by existing copper wire to houses in the village. The resulting download speed would be dramatically increased from the current 1.0/1.5 Mbps to 80 Mbps for those living near the new cabinets (speed will be less for those further away). In the longer-term “fibre to the cabinet” opens up the possibility of “fibre to the home” and speeds up to 300 Mbps. "Right now the EPC, thanks to Julian Wright’s considerable efforts, has obtained a design and quotation from BT Openreach to do this. The sum is quite large but we want to explore the possibility of obtaining the funds in part from residents; in part from Hampshire County Council and in part from businesses in the parish. At this stage we are anxious to ascertain the appetite among villagers for putting their hands in their pockets to support the project. The total project cost is c£80,000. For example if 25 owner occupier households (no business) were willing to contribute £500 each; If 15 owner occupiers running part/all of their business from home contributed £750 each and the owners of rental properties (approx 8) another £750 each that would raise £29,000 in total or 36% of it which might be enough to persuade Hampshire to grant us £300 per house – say £36,000 or £65,000 in total and we are a reasonable way to the total. Whether this would be possible depends on the interest within Ellisfield in trying to do this collectively. "Whether BT Openreach would offer a discount for a period to reward those who participate is naturally another area we want to explore; as is the possibility of a discount being negotiable on the cabinet project cost if enough people sign up. "Monday’s EPC meeting offers an opportunity for villagers to let us know their feelings and hear more from BT about their perspective. In addition if you cannot come but might be prepared to participate, it would be terrific if you could let Jacqui know that. If you would be prepared to be part of a working party to try and make it happen that would be really good to know too." BT will be attending this meeting to "present their solution for Superfast Broadband for Ellisfield". Your council continues to work towards securing improved broadband speeds for the village. We remain eligible for some form of improvement to be offered by Hampshire County Council (HCC) to improve speeds beyond the 2 megabit per second minimum by end Q4 2015. The next round of HCC procurement to increase coverage of Superfast Broadband in the county from 90% to 95% is underway, with implementation scheduled for 2016/17. There is no guarantee that Ellisfield will be included in the 2016/17 project and so we have lodged a request for a direct quote from BT. On Monday, October 14, this website ran a News item (see below) regarding the Hampshire County Council (HCC) Big Picture Map which showed the proposed roll-out of superfast broadband throughout Hampshire. Those who looked at the map will have seen that it showed the Herriard exchange being upgraded before the end of 2015. It also showed the southern part of Ellisfield as being in the 2015 roll-out. “BT will be providing superfast broadband (VDSL) via the Herriard cabinet (located near the Fur and Feathers). Regrettably the VDSL technology is currently short-range and will not support superfast broadband over long copper connections. In some cases lines in Ellisfield are up to 7 km long in the lower part of Ellisfield (some of the area marked in green on the map). The existing ADSL broadband service will however remain in place. “All of Ellisfield is eligible for some form of broadband upgrade by the end of 2015 owing to the slow, sub 2 Mb, download speeds. Ellisfield is also eligible for consideration as part of the 2017 superfast roll-out. Hampshire County Council (HCC) have published what they call “The Big Picture Map” (click to display the relevant HCC page in a new tab) showing the areas in Hampshire that will benefit from superfast broadband coverage in a countywide scheme to provide a high speed network. The map shows planned coverage by the end of 2015 and HCC will be publishing more detailed maps as each phase enters deployment. This map was passed on to Ellisfield’s Cllr Julian Wright last Friday and, at this evening’s Parish Council Meeting, he promised to investigate the ramifications for Ellisfield residents and pass on his findings to this website. Julian Wright and Sarah Galbraith will be making a presentation sharing their experiences with (from Julian) 3G and (from Sarah) satellite broadband. Julian will also be announcing an Ellisfield fast broadband community initiative. "Hampshire County Council have signed a contract with BT for a programme that will roll out super-fast broadband to 90% of premises across the county by the end of 2015. "There are 3,500 premises in Hampshire within the final 10% that have broadband speeds less than the 2 mega-bit minimum standard. In these cases, which includes Ellisfield, BT will deploy point solutions to individual properties based on satellite, 4G or other technologies but this is currently scheduled for the final part of the three-year roll-out. "We are working with HCC and others to see what opportunities there may be for a comprehensive permanent solution, to super-fast standard, for Ellisfield and neighbouring villages and how this might be funded. UPDATE: This report will now be given at the Annual Parish Meeting (see above post). Hampshire County Council (HCC) has awarded a £13.8 million contract to BT to deliver their broadband plans for Hampshire. Work will start immediately on the project and the first premises will be connected by the end of 2013. It is well known that parish councillors Tim Guinness and Julian Wright are determined to ensure that fast broadband reaches Ellisfield. Whether or not this HCC/BT contract helps them to fulfil their wishes remains to be seen.